The Graveyard Book, by Neil Gaiman, is about Nobody Owens, called Bod, and his life growing up in a graveyard. When he was less than two years old, his entire family was killed. Bod escaped death by tottering out the front door of the house, walking up the hill and entering a graveyard. He is found there by the ghost of Mrs. Owens, a woman who lived over 300 years ago and who never had any children. She and her husband undertake to raise the boy they name Nobody Owens, with the help of the mysterious caretaker Silas. But, as one character says, raising a child "takes a graveyard" and every ghost must chip in, teaching Bod his alphabet, his numbers, how to Fade and walk through walls and how to Dreamwalk. Bod grows up, in between the worlds of the living and the dead, friends with both sides but not quite fitting in with either. He wants to learn, but his guardians are worried of letting him outside the graveyard. He goes, anyway, and gets into some worrisome scrapes, inside and outside the graveyard. He gets abducted by ghouls. He meets a girl, and becomes her friend. He meets the man who killed his family. And throughout the book, he continues to grow and mature, though he keeps his innate and boundless kindness. Eva claims she did not force me to read this book, but she certainly gave me a suggestive nudge in the right direction and I am grateful to her for that. Like all of Neil Gaiman's stories (that I've read, that is), The Graveyard Book is a deceptively straight-forward story that touches on so many deeper and beautiful levels. Yes, it's a coming-of-age story, but such a wonderfully atypical one. Bod is almost working through life backwards and upside-down; he is comfortable with death and with people who do not change. He is confounded by the living world, where people can be cruel and selfish. He has access to one set of loving parents, who are dead, but his real parents (also dead) are lost to him forever. Instead of growing up with the same friends, he changes friends in the graveyard as he grows up, finding ghosts that are nearer to his age. But at the same time, Bod's story of growing up is much like everyone else's. He must set aside the excessive care that his parents and Silas have for him. He must step out of their overprotective zone and fend for himself. He must eventually grow out of seeing the people who are so important to him, because as a person grows, they lose the ability to communicate with the dead. And that is what is so powerful and heartbreaking, to me, about this novel. In life, parents often assume that they will leave the world before their children do, that they will see their child grow up and succeed and share those important moments with him. In The Graveyard Book, the ghosts have no such assurance. They know that Bod will eventually have to leave them, and that they may not see him again. But they all raise him, anyway. It is the same sort of parental sacrifice. This is a lovely and elegant book. Bod and his extended family are so good, and so kind, that you just want to hug them all. Even the simplest lines would make me tear up, like when Bod stands up to a bully. "Stop behaving like other people don't matter. Stop hurting people." Bod is a character who stands tall and firm and I loved him. I loved all the characters. They are all memorable and wonderful and I wish there was more of them in books everywhere. I want to know so, so much more about Silas. About Miss Lupescu. About the poor souls buried in unconsecrated ground, without so much as a headstone. 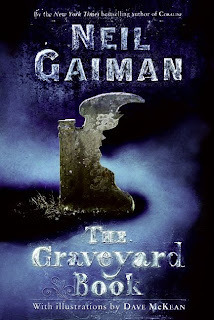 Gaiman always leaves his readers wanting just a little bit more, never quite giving us the whole story. And I wish I had more time with all the fantastic characters of The Graveyard Book and that I could be their friend, but that cannot be so. I had to finish the book and leave them behind. I really enjoyed this book and one of my sons read and loved it too. I just won a copy of this book in a giveaway and have been looking forward to getting it and reading it. Your review just makes me look forward to it all the more. My curiosity it definitely piqued now, have got to read this for myself! I love this book. My daughter got it for me on Mother's Day last year. It was fantastic. Great review. I loved this book too! Gaiman has such an amazing way of making you love his characters. He fills them with such depth and colour. And I'm always impressed with his world building skills. He takes what he knows and changes it ever so slightly so that what you see is something completely different. Awesome review. I especially like what you said about wanting to know more, but having to leave it behind -- that's exactly how I felt, too. I love it when books do that to me. Amanda- Yes, I remember you enjoying it! I'm glad it's making the Gignac rounds. Pam- What a great mother's day gift for you! Especially considering Bod's relationship with his mom. It's so sweet. chasingbawa- You know, you're absolutely right about him changing the world just a little, and presenting you with something different. That's so what he did in Neverwhere, too! Kiirstin- I'm glad I was able to describe that properly. I felt my review didn't do great justice to the book, but that was really a very bittersweet feeling at the end, when I was done. The audio book, even more so than the stellar Corlaline audio book, is also amazing. When it comes to children's books, my criteria always rests with the little people, and all the little (and midsize) people I teach think Gaiman rules. Enough said for me. Good review. I loved this book. I was craving for more stories of Bod when the book ended. I listened to it and Gaiman did an excellent job with it. Neil Gaiman delivers again! I am super excited to read this. Great review! Frances- Everyone keeps talking about the audio version! I will have to look out for it. Tanu- Again, the audiobook :-) Must try to scrounge it up. I definitely want more of Bod! Sudha- Of course he does :-) I hope you come to Chicago so we can see Gaiman speak!! I was surprised by how much I enjoyed this one. I was in tears at the end. This is one of my absolute favorite books. The audio version is superb. Neil reads it. I could listen to him read the phone book, quite happily. It might interest you to know that Bod appeared in an earlier work, a short story, by Neil. If I remember correctly, it's in Fragile Things. Also, I read somewhere that he's working on a sequel. I am glad to see that you finally read this! One of my favourite Gaiman's. Heather - You made my day by telling that there might be a sequel. Gaiman introduced Bod in M is for Magic, which included the story of the witch's headstone. That book was a decent read. Aarti - You have to check out the audiobook for The Graveyard Book and Coraline (if you haven't already). I can guarantee that you will like the books even more than now. Such a good book with such a bitter sweet ending! I'm hoping there will be a follow up novel. I just finished my audio reread, and I was delighted all over again. I have no clue how I'm going to review it though...I didn't review it after my first read (was during the Crazy Time), and short of: "OMG, I love Neil Gaiman! Bittersweet! Ghosts! PERFECT" I don't really know what to say. Have you read A Fine and Private Place by Peter Beagle? It's another bittersweet story w/ ghosts set in a cemetery. And it's AMAZING. I started this on audio a while back but did not get into it at the time. Your post has inspired me to add it to my list once again. I wanted to know more about Silas, too! Great review...I loved the book, but I could never articulate why. You, on the other hand, did a fantastic job! Wow ... this book sounds amazing. I need to add it to my list. You know, I had not really been too excited to read this book before, but after reading your review and realizing that this story is filled with characters that one can admire and like, and that it is such a direct and involving story, I think I have changed my mind. I have also heard that this book works well for almost all age groups, so it would probably be good for my kids too. Beautiful review, Aarti. There is no way I could pass this one up after having read your thoughts on it. I loved this book and actually started a re-read this year. My fave chapter, in particular, was Danse Macabre. Such a beautiful bit! Glad you enjoyed it as much as I did. I have got to read a Neil Gaiman and this is the one I want to start with! Great review! This was my first Gaiman book. You are absolutely correct that he does have gift of leaving us wanting more. A part of me keeps hoping that he will write a sequel so that we can learn more about Silas and Miss Lepescu and even Bod as he faces life in the real world, but then again, would it ruin some of the magic to learn more about these characters? Kailana- I'm glad I read it, too :-) It was lovely. Tanu- Heather made my day, too! And thanks for the M for Magic information. Eva- Yes, sometimes it's hard to review a book that you love because it's hard not to be just a fangirl. And I put Beagle on my wish list! Charley- I hope you try it again- apparently the audio version is amazing! Zibilee- I hope you read it! I think your kids would love it, too! Andreea- Oh, fun! It makes sense about Miss Lupescu, actually, with the story, too. Andi- I LOVE THAT CHAPTER, TOO!! bookmagic- I don't think you can go wrong starting with this one! Or Stardust. Or Neverwhere. Michelle- Yes, I wonder that, too, but I'm such a glutton I'd love it. I read my first Gaiman last year (Coraline). Have been wanting to read this next, but am still to get down to it. To be honest, been wanting to "hear" it. I'm glad you liked it. Gaiman is my hero -- Anansi Boys is one of my favorite books of all time (the audio is fantastic, narrated by Lenny Henry who was the inspiration for the main character). I liked The Graveyard Book though I think it's awfully creepy for youngsters -- I imagine it as more of a YA book. I've also heard it's somehow inspired by The Jungle Books, but I don't really see that. (Of course I am only familiar with the Disney movie). And I loved M is for Magic, lots of great stories. My favorite one is called Chivalry, which is also in Smoke and Mirrors. I didn't expect this to be a book about parenting and family and letting go when I picked it up - that aspect of it surprised me, and very much touched me too. It was beautifully done. I'm so glad you loved it too! I agree that this book was all too short! I wanted to spend more time with all of them. Kinda hoping Neil Gaiman will write a sequel, even though sequels are not hugely his thing. I have yet to read this particular book by Gaiman but I do hope to at some point. I am glad to hear you enjoyed it so much. I was going to come and mention the audio book too. I am pretty sure you can still watch it online. So glad you enjoyed this one. Now you've made me want to read it again! It's one of the few Gaimans that I didn't quite love the first time through, but I've got the feeling that'll change after I've read it a second time. I totally felt EXACTLY the same way about this book. It was just so elegant and beautiful, and all of the characters were so engaging that I wish Neil would write a book of short stories with a story devoted to each of the characters. This is really Neil at his best!